I have been growing blueberries in my garden in pots or containers for the last 5 years. I have also tried to propagate blueberries from stem cuttings and, by now, have grown 9 such plants; one of which will be producing fruits this year. 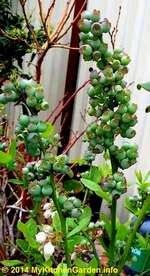 Read below the details on formation of buds, flowers and fruits in blueberry bush. My two plants are early fruiting variety and the others are late fruiting variety. The early variety plants started to form buds in mid winter and the late fruiting ones started to form buds in late winter. The buds are formed on the new growth at the leaf joints. 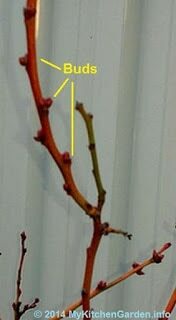 The leaves of the late variety blueberry plants first formed false light red colour and then shed all the leaves at the time of opening the buds. The leaves of the early variety did not change the colour at any stage and they did not fall also. Each bud opened into several smaller buds, which ultimately produced cluster of flowers as shown in the above picture. As soon as the blueberry flowers started to open, an intense activities of bees started, sucking necter from the bloom clusters. The beauty of blueberry plant is that there is no problem like tomato blossom drop (needing hand pollination of tomatoes), thanks to the bees. Each flower grows into a berry, the fruits are formed into clusters.